This hybrid brings crew shirts to a whole new level. This 4 oz. 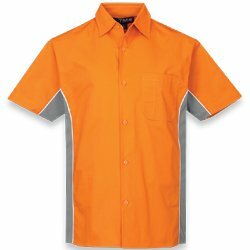 60% cotton/40% polyester short sleeve woven shirt has mesh knit side panels featuring Tri-Mountain UltraCool® moisture wicking technology. Accented with piping along contrast panels. Constructed with a left chest pocket with hidden tire gauge/pen pocket. Beneath back yoke features a large area for decoration.